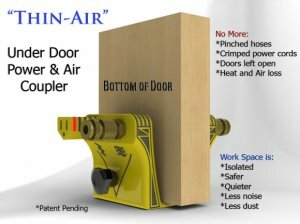 Check out this great new soon to be tool called Thin-Air. I say soon, because the Thin-Air is still in the final prototyping stage. It is pretty obvious from the photo as to what it does, but if you are a bit confused, I will explain. The Thin-Air is the solution to the pinched or flattened cords and hoses you get while running them under doors. It looks like this could also be mounted on the side of the door, for those occasions where you need to keep the floor clear for other trades. The Thin-Air is also a finalist in DIY Cool Tools Search for Americas Coolest Tools Contest, so be sure to vote. What do you think of this tool, and would you buy it? Let us know in the comments below.